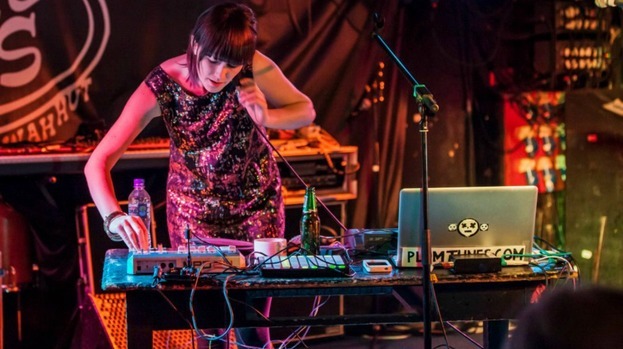 UK based electronic music artist, Plum (Shona Maguire) is an electro-pop producer and multi-instrumentalist celebrating the release of her fourth album, Besty Thunder. It’s received high praise online and off and we were happy to catch up with her and chat about everything from her incorporation of field recordings into her songs to her fascination with the sound of earthquakes. Look out for the January 2014 Femmecult Podcast that she’s kindly hosted for us. Femmecult:Where are you from originally and where are you now? Plum: I was born in Aberdeen in the North East of Scotland, and grew up in the countryside, but I now live in Brighton (on the sunny South Coast). Femmecult:Your bio says that you attended London’s Point Blank Music College. What prompted to to pursue an education in music and music technology? Talk about your early years before college and how your interest in making music began. Plum: Yes, it was a brilliant course. I have always been interested in music, patterns and sound. I undertook work experience at a recording studio when I was 15, and ended up going back for the next 4 or 5 years as much as possible to absorb as much information as I could. I couldn’t explain exactly the sound I was looking for, so that’s really what pushed me to learn the music tech side of things. So I could experiment with sound. I’ve never wanted to follow the masses. Exploring possibilities is what interests me the most about production. Femmecult: How did your musical composition style evolve from where you began? What influenced that evolution? Plum: The first track I recorded in college (Point Blank) was Toys. I sampled a little girl who sat next to me on the train and talked to me for hours about how her family were moving to London and she was going to have a shed where she could keep all her toys. That was fairly experimental, and I can’t say I’ve written anything like it since. But I have used the same techniques a lot – sampling my own sounds, chopping up samples, and playing with all sorts of effects. At that time I was very shy about putting my own voice on anything, but encouraged by my teacher Steve Travell, I started producing more tracks using my own vocals. So I think the biggest influence in the evolution of my songwriting and production has been my sense of self, and the willingness to explore vulnerability and production techniques. Femmecult: Obviously technology plays a big role in your productions. Do you have a hand in creating your own instruments? How do you balance that with developing your songs and songwriting skills? Plum: To a certain extent yes, I sample a lot of found sound and field recordings, and then play with them in the studio – pitch shifting, sampling, etc, but not so much in terms of creating new instruments. Though I’d love to have more time for that! A friend of mine helped me create home made floor pad samplers that I could trigger with my feet – they are great fun, if a bit temperamental. Femmecult: Speak about your songwriting process. How does it start and where does it end? Plum: Usually I start with a lyrical idea, or a feeling of something that I want to capture. Sometimes I start with a field recording that has its own swing and I find a BPM to fit it. Often I write the original melody on the guitar, sometimes the guitar stays in the final production, sometimes not. On Betsy Thunder I switched most of the guitar parts to synths, and then went crazy with them to give them more energy and movement. I have never been good at writing songs to a specific structure. I just follow where the song takes me. And they usually end fairly abruptly. I always write from the heart. Music is my therapy. I want to make music that moves people. Physically or emotionally. Plum: I’m really fascinated by nature and the Universe. At the moment I have been getting very excited about samples of earthquakes, slowed down crickets and humming sand dunes. I plan to incorporate some of these into my new work. I’m motivated to continually learn and better myself as an artist. And to show that female artists have a different perspective to show in electronic music, but that it is equally valuable. Femmcult: What have been some challenges or hurdles, if any, that you’ve have faced as an artist, and how did you overcome them? Plum: There have been so many challenges and hurdles. Not knowing where to begin. Not having faith in myself. Not being taken seriously. Not being able to read music. Not having enough money for equipment. Releasing my last album and EP independently was challenging, both financially and creatively. I have experienced a lot of sexism, but I have also received a lot of support from male friends and colleagues in the music scene. 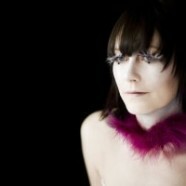 Femmecult: What are some highlights of your musical career thus far? Plum: Winning Best Electronic Act in the Scottish Alternative Music Awards last year has to be the highlight of my career this far. I was up against Chvrches, who are really big, so didn’t think I had any chance of winning it. I was the first female ever to be nominated in the Electronic category, and the first female solo artist to win a SAMA, so I am really pleased to be flying the flag for women. I am really proud to have been signed to Benbecula Records in 2009. I was the only female artist ever signed to Benbecula Records, a cult underground label in Scotland, along with some incredible electronic solo artists such as Christ., Frogpocket on youtube (also on Planet Mu) and Araya. I won the Make Your Mark in Music award by the Arts Council of England in 2008, and was voted “Best New Music of 2007” on a New York radio station. Plum: I think creative people will have myriads of ways to express themselves creatively in whatever they do, so it’s hard to be specific. I like climbing trees, mushroom hunting, playing leapfrog, dancing, making treasure hunts, cooking, watching films. I had a lot of fun making things out of cardboard for this music video too. Femmecult: How do you prepare for live performances? Does your setup change from show to show? Plum: I hope one day I will find the perfect live show, but mostly it does change from show to show, sometimes it’s minor tweaks, sometimes I’m using an entirely new set up. I usually pick apart the songs into what I can realistically achieve as a solo artist on stage lacking several additional limbs. So I’ll take the guitar, bass or keyboard part, and do that live, and the vocals, and the rest will be triggered either via foot pedals or will run as a backing track. I use the Novation Launchpad to trigger samples, and an MPD to add effects, trigger samples, drums and filters. Femmecult: Talk about how your live performances have evolved over the years. Plum: I started out blushing continuously throughout the set, stiff with fear, and singing very quietly into the microphone. I have tried working with a live drummer, a DJ scratching on top of the tracks, a friend doing keys and triggering samples, and finally have found my feet as a solo act with a myriad of buttons to press, which is the most enjoyable. Femmecult: As winner of many prestigious awards and accolades for your work, what advice do you have for other artists desiring similar success? Plum: It’s bloody hard work, but keep going! Femmecult:What does the future hold for Plum Tunes in terms of tours, upcoming releases, and/or new projects? Plum:I’ll be touring the UK (and hopefully a few European dates but nothing is confirmed yet) in March and April, and will be releasing Betsy Thunder Part Two as a series of singles by summer 2014.